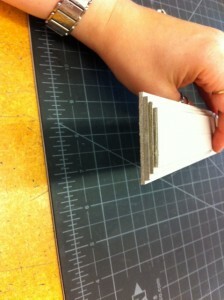 I have learned that taking photos of some of the steps we learn in class helps me more than my obsessive note taking. 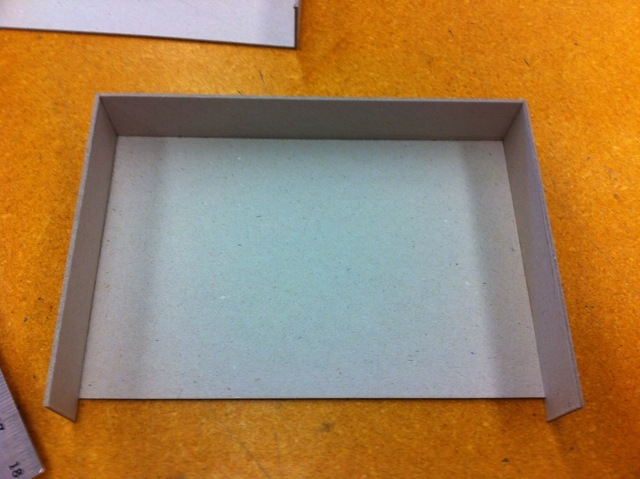 So, thanks to my little iPhone having a pretty great little camera on it, I have many photos from the class. I will post them, with a little description of what is going on, in the hopes that it will either help some of my other class mates who might need a reminder, or that it will entice people into taking a class at MCBA. 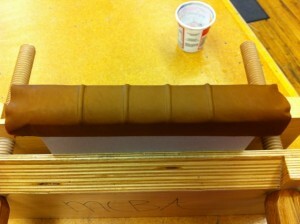 This class was all about how to make a drop spine box with a leather spine. It was taught by Jana Pullman. To say she is a great teacher is an understatement. 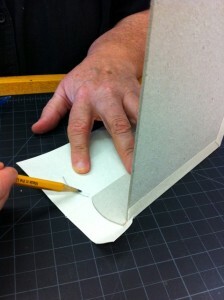 I find myself taking many of her classes because I understand the way she teaches, and she has so much knowledge of the field of book binding and box making. It was a very fun class, with a great group of amazing people. 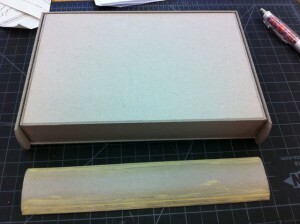 These photos and instructions are not very detailed or thorough. Jana gave us great hand outs, and a lot of verbal instruction. I highly recommend taking her class, or checking out her website I linked to above. She will be a much better source of instruction on these boxes than I will be … though I am sure I’ll get the hang of them a bit better after some practice! 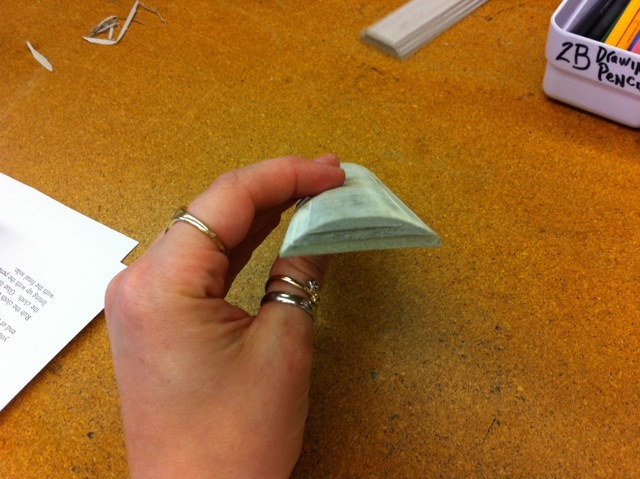 This piece is 4 strips of book board glued together and will become the rounded spine after a bit of filing. We start out using razor blades to shave down the edges, then we use sandpaper to smooth it out. 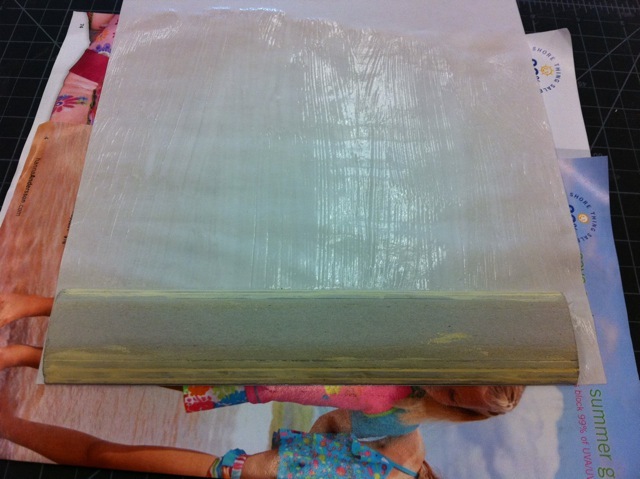 After filing down the book board edges, you can fill in any uneven spots with wood putty, and then sand to make it smooth. 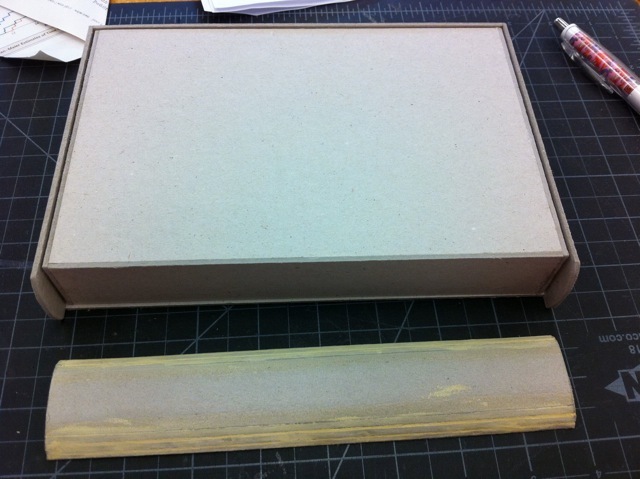 Both trays need to be glued together and allowed a bit of time to dry. It is smart to make sure the trays will fit inside each other, with a bit of room left for the book cloth. The sides of the bottom tray were covered with book cloth and the bottom edges wrapped around and glued down. 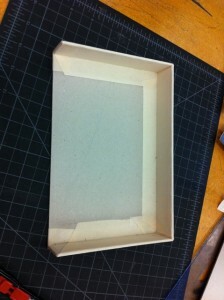 After making cuts at the corners, you can then fold the book cloth down and glue it around the inside edge of the tray. 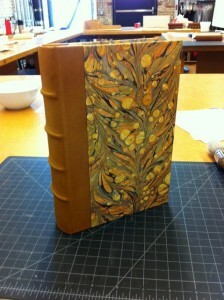 I did not make a few of the cuts quite right, and ended up pasting some extra book cloth in. 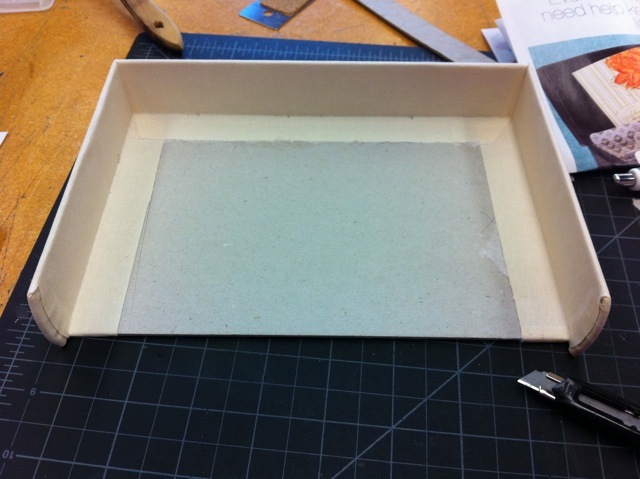 Book cloth is glued to the sides of the top tray, and wrapped around the bottom, just like the first. 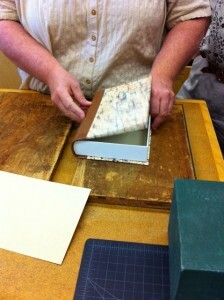 This tray has the rounded edges, so the book cloth has to be cut differently to fit snugly around them. 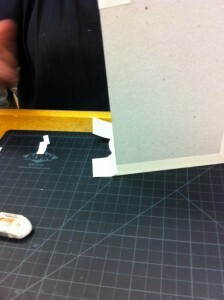 By cutting along the pencil lines, you can cover the rounded edge without any gaps. 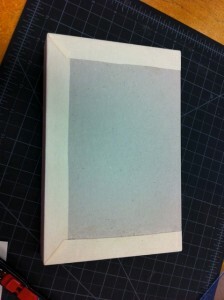 The inside corners of the book cloth are cut just like the other tray and the book cloth is folded and glued down. 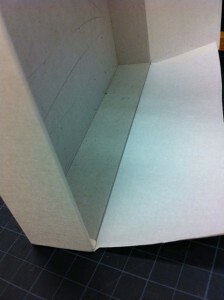 The rounded corner is completely covered. Yay! I didn’t have to patch anything on this tray! 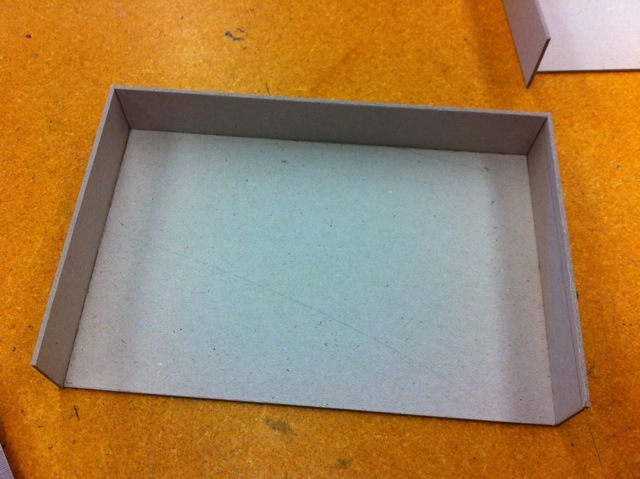 You can use the spine piece to trace a curve on the long ends of the top tray, and then cut and file the ends so that they make the same curve the spine piece does. 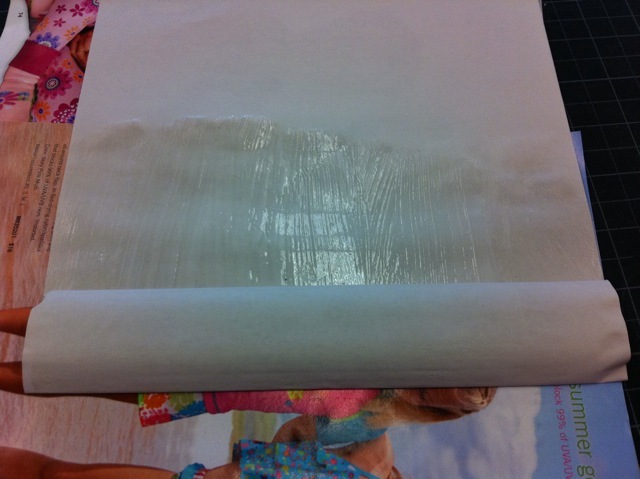 The spine piece is wrapped in paper. 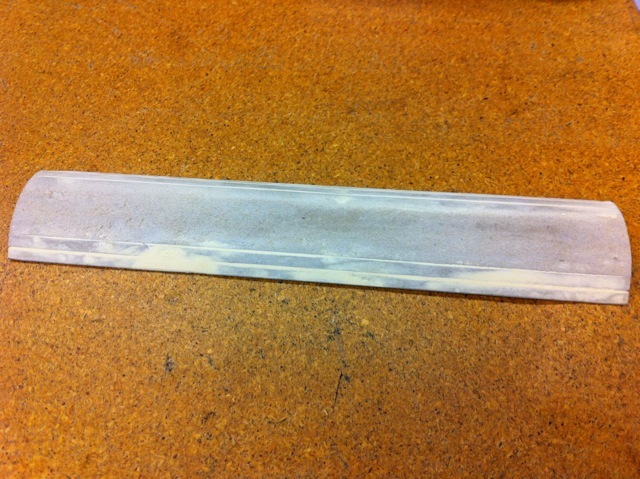 The extra paper on the edges is either cut or sanded off. 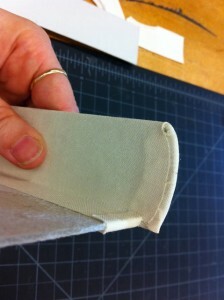 The ends of the spine piece get covered in paper, and then with book cloth. 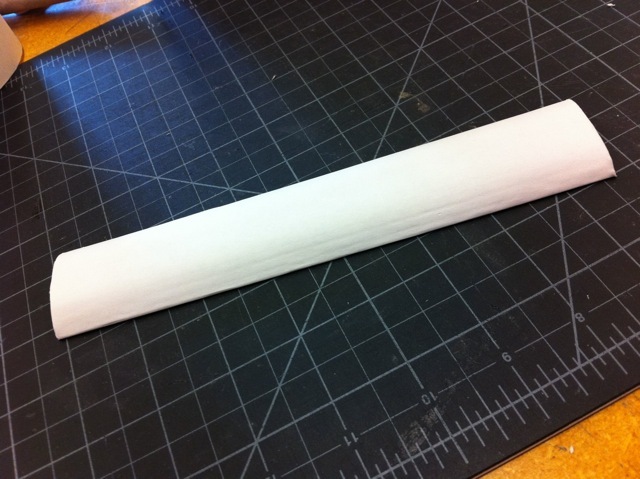 A strip of cardstock is cut to just fit around the curve of the spine piece and is adhered to the spine piece with weak, non permanent, double sided tape. 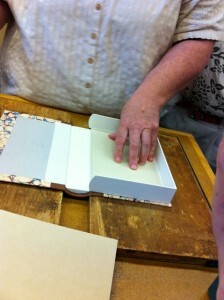 Cover the box in cellophane, and put the spine piece in place. It then gets placed in a clamp. Glue fake cords to the spine piece, and then adhere the leather to it. Let the leather dry completely before taking it out of the press. 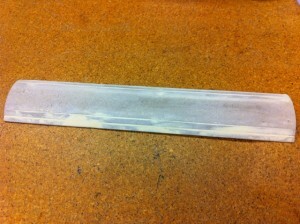 Take the spine piece out. 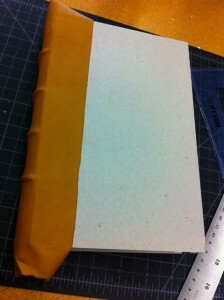 The flat side of the spine piece will get covered with book cloth, that will hinge on to the covers. 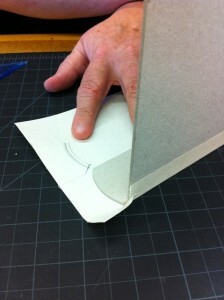 Cover the rest of the book board with your decorative paper. 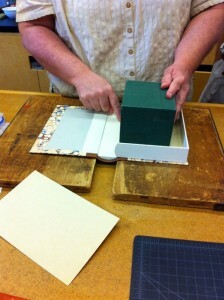 Carefully glue the large tray in, making sure it lines up with the spine. 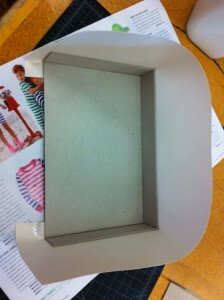 Set a weight on top of the tray to help adhere it to the cover. 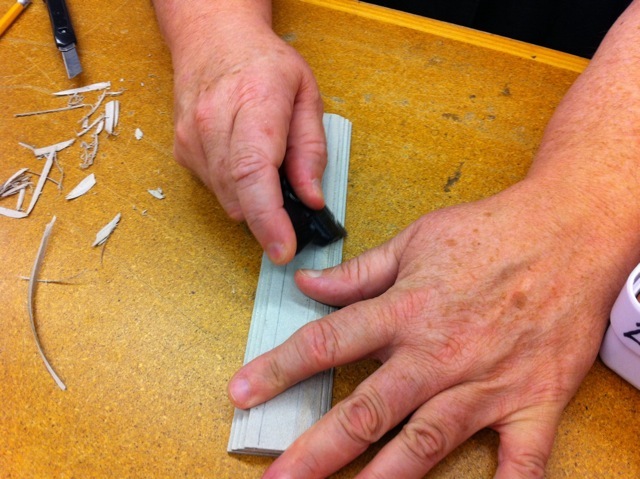 Carefully line up and glue down the next tray. 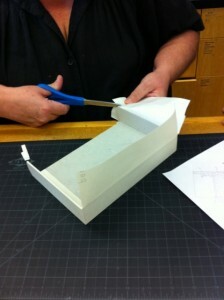 Jana gave us thorough instructions on how to cut all of the pieces to make more of these great boxes. 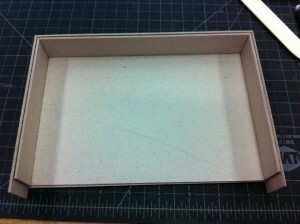 I have measurements figured out to make a series of smaller boxes to hold Polaroid and Impossible Project images. 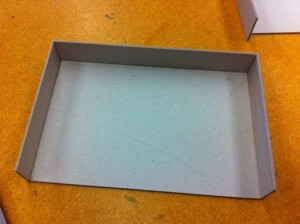 I’m hoping to start putting together a few of them very soon. I will post more pictures as I work on those.